The Kansas City Chiefs plan to wear their red-on-red uniforms Sunday night against the Cincinnati Bengals. To date, they are 4-3 in the red-on-red look. The Chiefs won their second of nine straight games to begin the season, as they debuted the red-on-red look for the first time. Alex Smith, in his second game as a Chief, threw for 223 yards and two touchdowns to defeat Cowboys quarterback Tony Romo. Wide receiver Dwayne Bowe had the go-ahead touchdown catch. 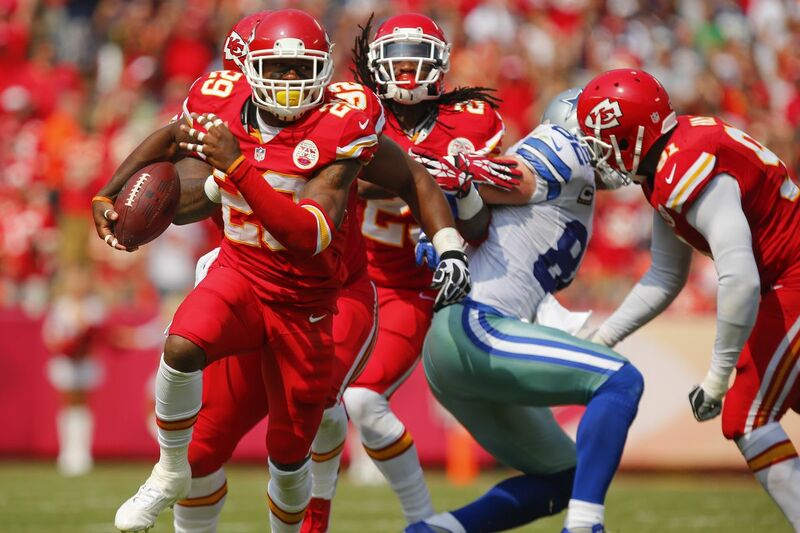 As seen above, safety Eric Berry recovered a Cowboys fumble caused by linebacker Tamba Hali during the game. 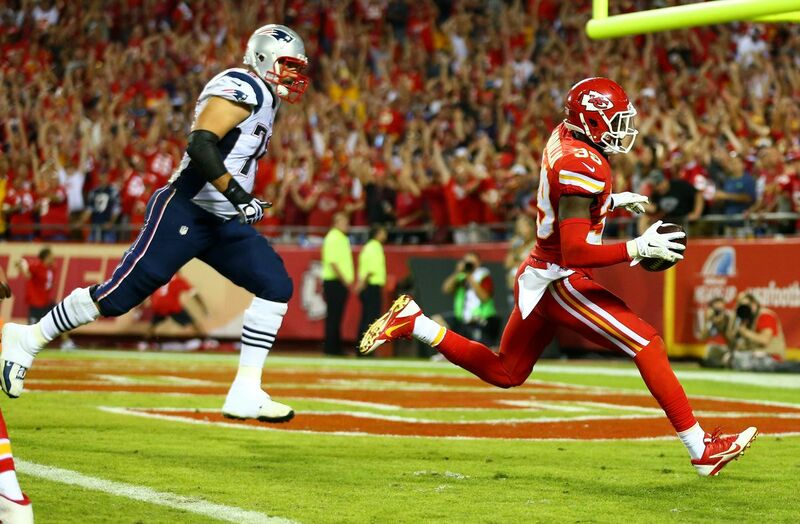 The Chiefs improved to a 2-2 record in a blowout of the New England Patriots on Monday Night Football. Running back Jamaal Charles had three touchdowns for the Chiefs in his return from injury, and the Chiefs picked off Tom Brady twice—including the 39-yard touchdown off an interception by safety Husain Abdullah (as pictured). This was the same night the Arrowhead Stadium crowd set the Guinness record for the loudest crowd roar at a sports stadium. Quarterback Peyton Manning continued the trend of the Broncos’ dominance of the Chiefs with Denver’s sixth straight win over Kansas City. The Chiefs’ first loss in the red-on-red uniforms dropped them to 7-5 on the season, and the Chiefs would go 2-2 the rest of the way to miss the postseason for the only time in Andy Reid’s duration as Kansas City’s head coach. This is not a fun game to remember if you’re a Chiefs fan. The Chiefs and Broncos met at Arrowhead Stadium in a Thursday Night Football thriller, and Kansas City led by a touchdown with less than a minute to go. 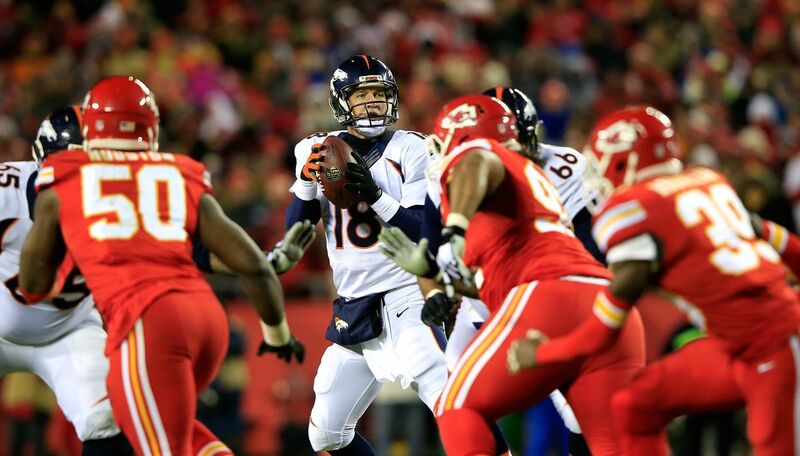 Peyton Manning and the Broncos tied the game at 24 with less than 40 seconds left, and the Chiefs got the ball back and were seemingly trying to kill clock leading into overtime. 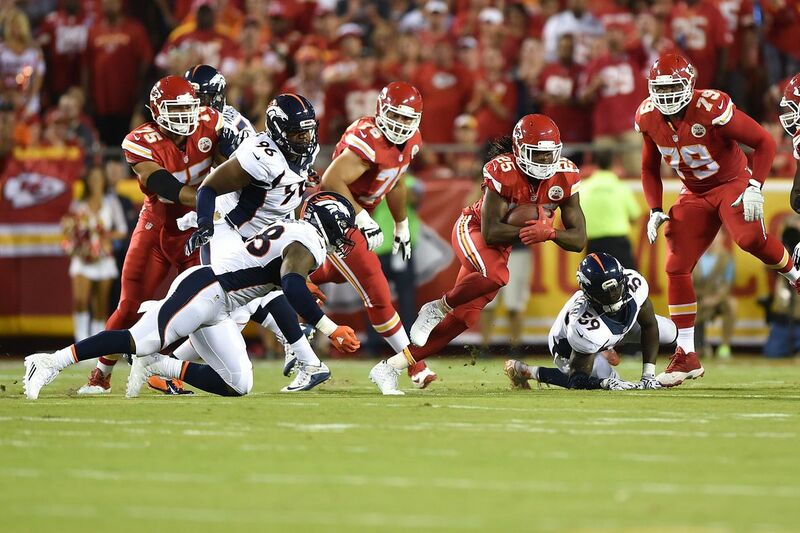 Running back Jamaal Charles took the handoff and fumbled the football, and Bradley Roby picked it up and ran it 21 yards back for the game-winning touchdown. The Tyreek Hill-chant game and Thursday Night Football. With the Chiefs already up 14-3, the Raiders punted to rookie Tyreek Hill. Hit was tackled, but the Raiders were called for a penalty on the play, setting up a re-kick. 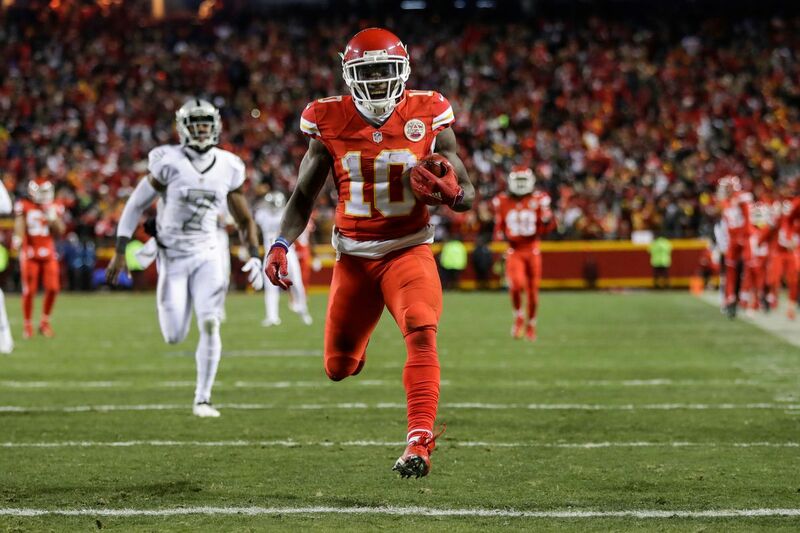 For the first time, the Arrowhead Stadium fans chanted his name prior to a punt— “Tyreek, Tyreek, Tyreek.” Hill returned the second try for a 78-yard return touchdown, and the Chiefs defense held off the Raiders for their 10th win of the season and control of the AFC West division. 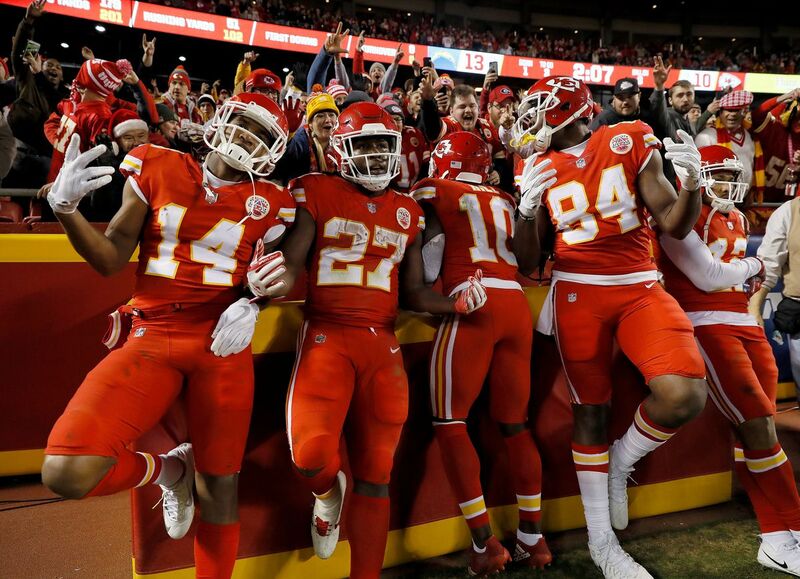 For the third time in a row, the Chiefs wore the red-on-red uniforms for a Thursday night game. It was the second game in connection with the NFL’s color rush initiative. The Raiders entered the game on a four-game losing streak against the 5-1 Chiefs. It was back and forth most of the game, with the Raiders rallying back from a nine-point deficit in the final quarter. With Oakland on the Kansas City doorstep down six points, the Chiefs took back-to-back defensive holding penalties, extending the game. On the Raiders’ third-straight untimed down, Derek Carr hit Michael Crabtree in the end zone for the win. This is the only road game in which the Chiefs have worn the red-on-red uniforms. The Chiefs wore red-on-red uniforms for their Saturday night game against the Los Angeles Chargers. After the Chargers took a brief three-point lead in the third quarter, the Chiefs never looked back. Alex Smith threw for 231 yards and two touchdowns and Kareem Hunt had 155 rushing yards and two total touchdowns as the Chiefs all but wrapped up the AFC West division at 8-6. This game was another key in Patrick Mahomes getting his Week 17 opportunity (with playoff position locked up), one that led to the Chiefs changing quarterbacks this past offseason. How will the Chiefs do in their red-on-red uniforms Sunday night? Let’s talk ball on Sunday night at the Arrowhead Pride meet-up!